I’m not saying this is a missed marketing opportunity, but Gatorade needs to do a little explaining. 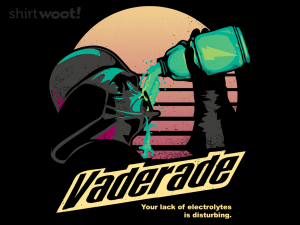 Jump on that Star Wars bandwagon, energy drink! I mean, I know your target demographic is athletes who need to replenish the nutrients that they lost through sweat without having to drink the same sweat, but, c’mon… How many grown-up nerds who wake up hungover after a night of partying in their Han Solo cosplay do you think half-mindedly stagger to the kitchen to replenish THEIR electrolytes with your flavored sugar water? Probably a lot, huh? Everyone loves Star Wars. I’m talking to you right now, Gatorade execs: Wrap this cloth around your torso to remind yourself of the opportunity you missed.